Day one: A broken water filter and a new friend. 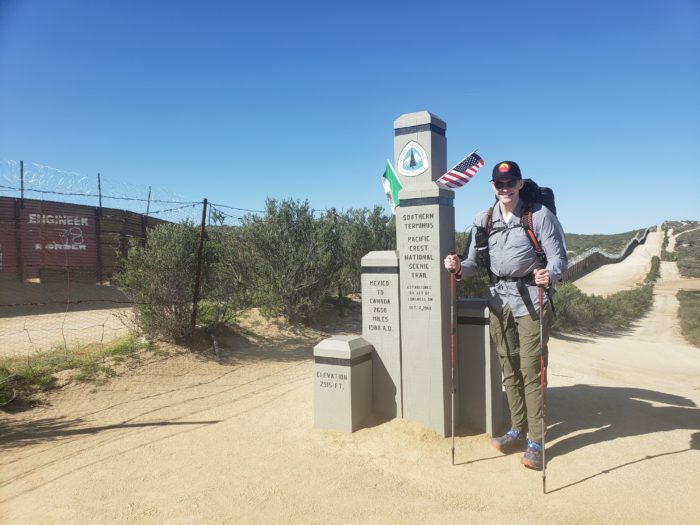 I’m finally on the PCT! I have waited so long to be here. I have spent countless hours dreaming of what it would be like. Now I’m lucky enough to get to experience the trail for myself. And what an amazing experience it has been so far. My parents and my girlfriend took me to the Southern Terminus and after some photos, a Leave No Trace briefing from the Southern Terminus hosts, signing the register, and then some very difficult goodbyes, I set off down the trail. I was even luckier when I got one last hug at the first road crossing when my family happened to drive by on their way back to San Diego. I quickly found that I was mildly obsessed with the signs on the PCT. So much so that at the beginning I was taking pictures of every trail marker. This was pointless as the trail is very well-marked and that taking a picture of every identical sign might not be the best for my phone’s storage. Then I hit mile one. The feeling of surprise that I had already made it there and the joy I felt seeing the mile one marker took my breath away. Not even half a mile later, I ran into two hikers. 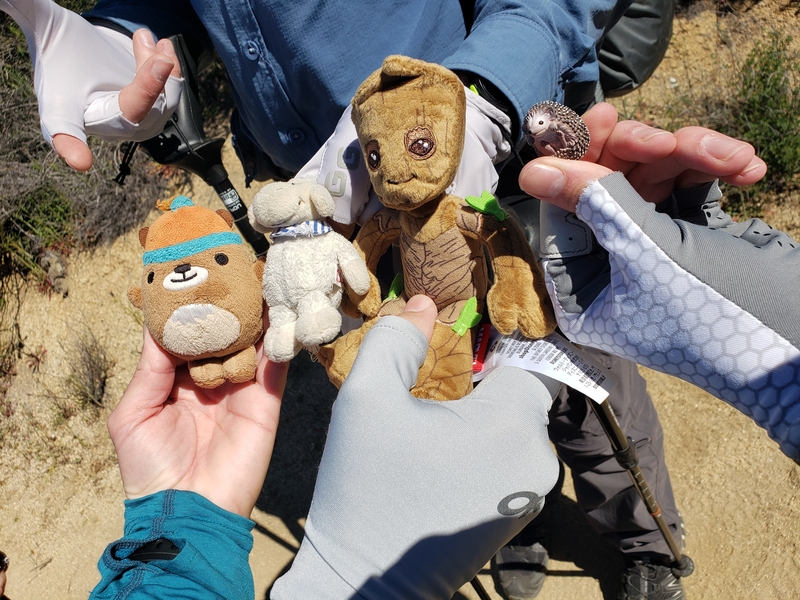 The first was named Groot and he was clearly thru-hiking north but the other just had a small day pack and was heading back toward the terminus. 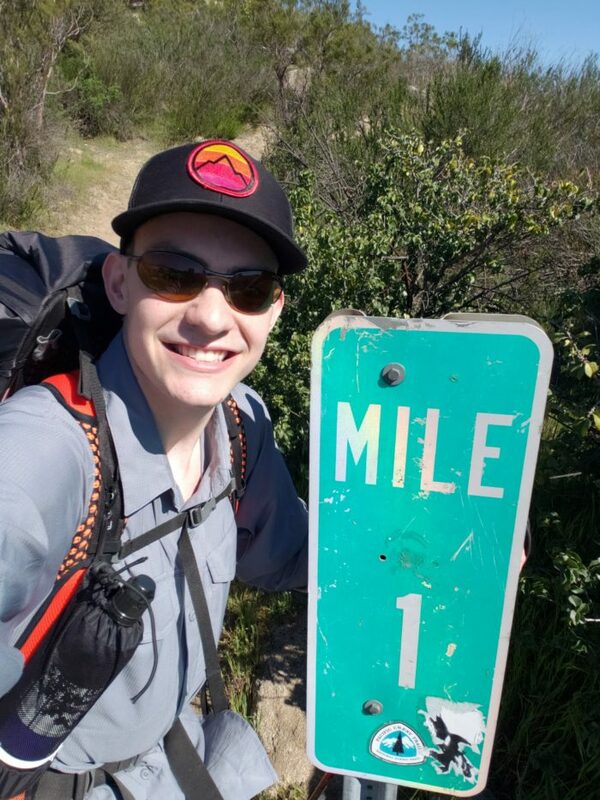 I stopped to chat and found out the day hiker was a past thru-hiker and vlogger named Muk Muk who had hiked in 2013. We were quickly joined by another man named Michael who had been at the terminus at the same time that I had. We found out that all of us had our own little hiking buddy that we carried, so my little hedgehog came out of my pocket and we took a picture of all of them together. Michael, Groot, and I headed off together, passing the famous mile three sign and came to the first decent water source at mile six. We decided to chug some water while we were there; a process thru-hikers call “cameling up.” Michael found that the Sawyer Squeeze water filter he had brought had frozen during his transatlantic flight and was now broken so I let him borrow mine. It didn’t seem like a big deal at the time but it turned out to be one of my best decisions on trail so far. Since you won’t last very long without water and with no chance to get a new filter for several days, Michael and I agreed to stick together so we could share my filter. He became my hiking partner and a true friend. 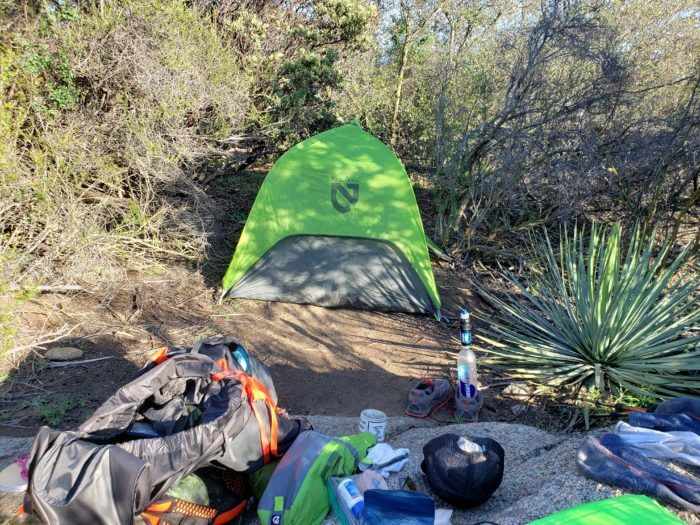 We stopped to camp about 12 miles in where I practically pitched my tent in a bush to avoid ant hills. Even after a hot, tiring day I found myself tossing and turning a bit but sleep eventually found me. The Pacific Crest Trail is treating me to stunning views and amazing people. I feel like I fall more in love with my surroundings with every twist and turn of the trail.